The U.S. Geological Survey has released a national database of geochemical analyses for 45 major and trace elements at each of 4857 sample sites from across the U.S. The USGS gave us an online briefing of the system and we are just starting to explore the data for Arizona. According to the announcement the USGS began sampling in 2007 for a low-density (1 site per 1,600 square kilometers, 4,857 sites) geochemical and mineralogical survey of soils in the conterminous United States as part of the North American Soil Geochemical Landscapes Project. The sampling protocol for the national-scale survey included, at each site, a sample from a depth of 0 to 5 centimeters, a composite of the soil A horizon, and a deeper sample from the soil C horizon. "The resulting data set provides an estimate of the abundance and spatial distribution of chemical elements and minerals in soils of the conterminous United States and represents a baseline for soil geochemistry and mineralogy against which future changes may be recognized and quantified. This report releases geochemical and mineralogical maps along with a histogram, boxplot, and empirical cumulative distribution function plot for each element or mineral." Highlights of the USGS Soil Chemistry Program – now in public release. • 4857 sampling sites (1 site/1,600 km2) conterminous U.S.
• Produce a soil geochem and mineralogical database in conterminous U.S.
• Establish an archive of soil samples. • Sampling at 0-5 cm, composite of A horizon, composite of B or C horizon. • Soil pathogens (0-5 cm depth) – anthrax, plague, hooray! • Interactive web site in the works – release scheduled next week. 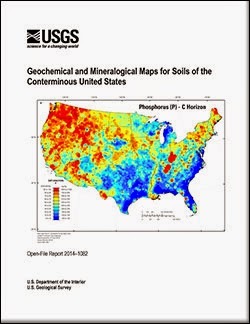 Smith, D.B., Cannon, W.F., Woodruff, L.G., Solano, Federico, Kilburn, J.E., and Fey, D.L., 2013, Geochemical and mineralogical data for soils of the conterminous United States: U.S. Geological Survey Data Series 801, 19 p., http://pubs.usgs.gov/ds/801/.